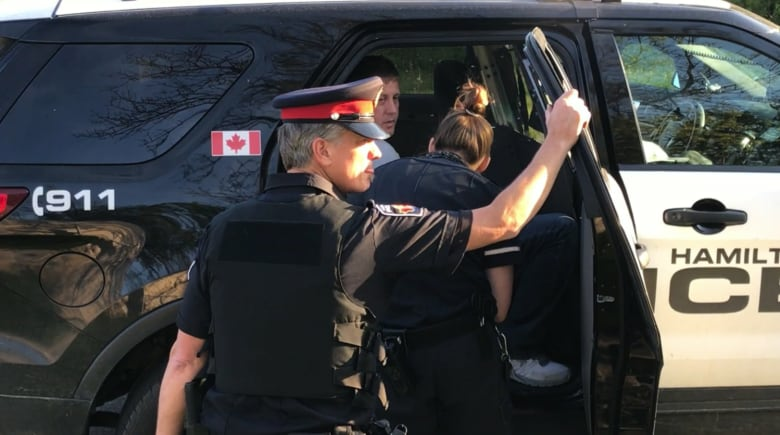 A Hamilton police officer is facing Police Services Act charges in connection with the arrest of two photojournalists at the scene of a fatal accident in 2017. Although two journalists were arrested that day, the police act charges only relate to Cohn's arrest. News director Mackay Taggart said while the arrest of the Global journalist in Hamilton was one specific incident, it seems to be part of a larger pattern that's at play. "We're seeing patterns … of journalists being prevented from going about their work, and that's concerning," he said. "Our journalists are just doing their jobs the way anybody is doing their job, and when you are in your workplace, whether it be in an office or out in the field, you expect a certain degree of respect and safety and those things were violated that day." K.C. Wysynski, the lawyer representing Todoruck, said she intends to "vigorously" defend the allegations made against her client. "The day in question was a very challenging and traumatic day for many people, and Const. Todoruck did the very best he was able to do in the circumstances and with the resources that were available to him." Wednesday's appearance lasted just over 10 minutes, as hearing officer Greg Walton put the matter over for six weeks to give the lawyers involved time to produce documents, vet them for personal information and give Todoruck a chance to review them. Taggart declined to go into detail about how the arrest impacted Cohn, saying he's hopeful the photojournalist will be able to express that himself as the hearing goes on. "We believe we have the right to report the facts and the circumstances surrounding the incident without any interference with any third party, while respecting the law, which we believe our journalist was doing that day," he said. "It's important that the public have an avenue to know what's going on in their community that's unbiased and not influenced by a particular objective or perspective." After the arrests, Canadian Journalists for Free Expression came to the support of the journalists and called for the Ontario Civilian Police Commission to investigate further, noting media covering accidents is "routine" but being arrested for it was "out of the ordinary." Jeffrey Dvorkin, the director of the University of Toronto's journalism program, described the arrests as "an affront to journalism and to the law." Ritchie reportedly said that when he arrived at the scene, Todoruck called the media "scumbags," leading to an argument that ended with the freelancer being tackled and arrested. When officers did put up police tape, Cohn stayed behind it "at all material times," the claim adds. On Thursday, the Canadian Association of Journalists (CAJ) issued a statement saying the organization was "encouraged" to learn about the charges against Todoruck. Describing the video of Cohn's arrest as "appalling and frightening," said CAJ president Karyn Pugliese also acknowledged a "concerning pattern" of police agencies interfering with journalists. "We can hope that this unfortunate incident can lead to a happy ending if it teaches police to better respect our charter rights and freedoms."